It's easy to grow more zucchini and summer squash than you can possibly eat, and even friends and neighbors can get tired of zucchini bread. Fortunately, zucchini and other summer squash are among the easiest vegetables to dry in a dehydrator—and dehydrated zucchini and squash will stay tasty and fresh for recipes all year long. To use your summer bounty in the dead of winter, just re-hydrate squash and add it to pureed soups, stews, and other dishes. The dehydrating process takes about a day. Most of the process requires no active work on your part. For those using an oven, remain at home to monitor the squash and wait to remove it at the right moment. For those using a dehydrator, feel free to just set it and go. Blanching your squash before dehydrating is a great way to retain color and texture. Blanching is the simple process of boiling the squash whole for about one minute, and then, immediately plunging the hot vegetable into extremely cold water. Know that blanching is an optional step, and it doesn't impact the taste of the zucchini. For those who plan to puree the squash for soup, for example, color and texture are unimportant. Wash the squash. You won't be peeling them, so you should gently brush or scrub away any dirt. Slice the squash into 1/4 inch thick rounds or pieces. Arrange the squash pieces on the dehydrator's trays leaving space between the pieces on all sides. Make sure they are not touching each other because that will result in inconsistent drying. Leaving space around each piece for airflow will be more effective in drying the slices. Set the dehydrator for 135 F, drying the squash until crisp-dry, which will usually take about six hours. Remove the dried squash from the dehydrator, and let it cool at room temperature for 10 minutes. Once the dried squash is cool, transfer it to airtight containers. Label the containers to identify the contents and include the date that you dried the squash. This will help in identifying it later, as well as knowing which containers you dried earlier or later so you can use the oldest first. Store the dried squash in airtight storage containers, and leave them in a cool, dark place. For those who don't have a food dehydrator, it is possible to dry zucchini or squash in your oven. One problem is that many ovens don't have a temperature setting below 150 F. As a result, it's hard to get the consistent temperature needed for drying squash, which is between 125 F and 140 F.
To use an oven, first prepare your zucchini as in steps 1-3, arranging them on a cookie sheet or baking sheet covered with parchment paper. Place them in an oven set to the lowest heat setting, and prop the door open about an inch. Check the temperature with an oven thermometer. Dry for four to six hours until the slices are crisp. 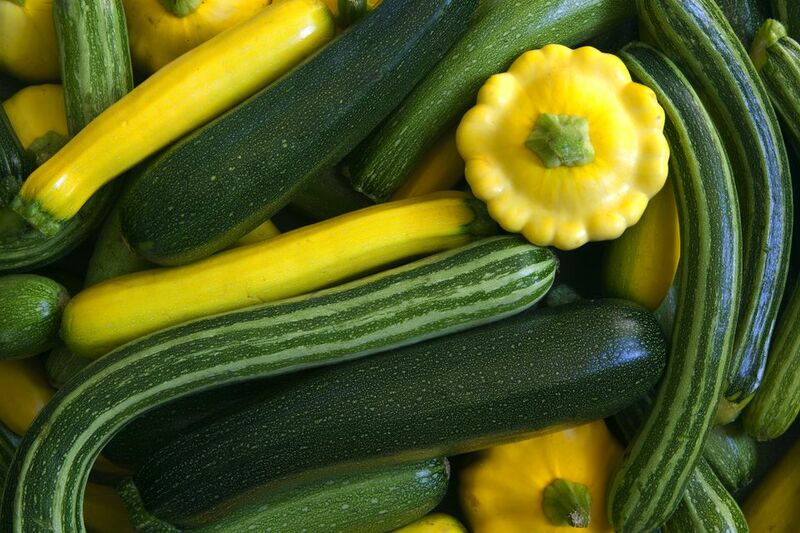 To use dehydrated zucchini and summer squash, pour boiling water over the squash, and let them soak for 15 minutes. Once the vegetables are properly plumped up, pour off the water, and use the squash as usual in your favorite recipe.